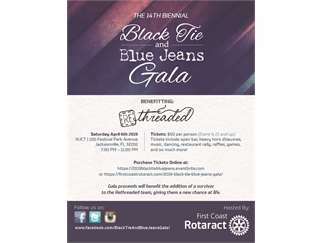 First Coast Rotaract is throwing their 14th biennial Black Tie and Blue Jeans Gala on Saturday April 6th at WJCT (100 Festival Park Avenue) to benefit Rethreaded!>The gala will feature an open bar, live music from Who Rescued Who, and heavy hors d’oeuvres.Come join the festivities: Try to win your favorite bottle at our liquor bottle ring toss game, check out our amazing silent auction and raffle items from local brands you love! Enjoy wine tasting with a sommelier, and of course, join us on the dance floor!Dress to impress, Rotaract and Rethreaded love your creative energy and it's certainly encouraged with our black tie meets blue jeans theme. We hope to see you there so we can all party with purpose!